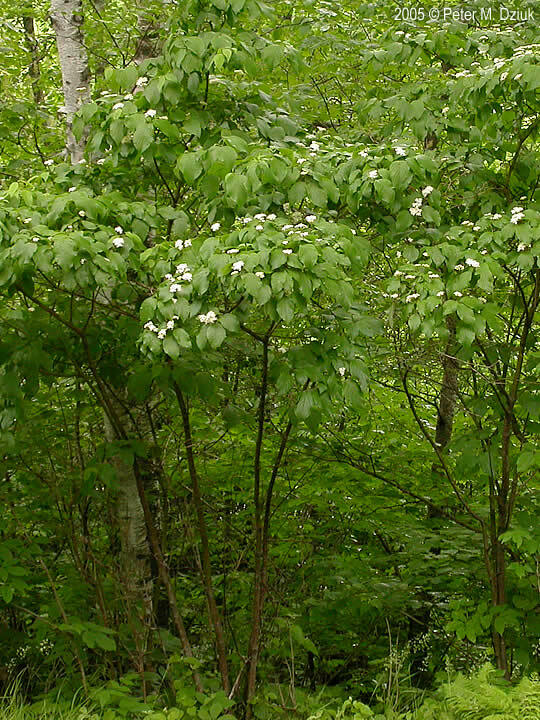 Cornus rugosa shrub in bloom. 2005 © Peter M. Dziuk. Minnesota Wildflowers. minnesotawildflowers.info (Accessed 1/2018). Cornus rugosa is a shrub to 4 m tall, often with only one stem, bark gray, twigs hairless, curving upward from one node to the next, (like flowering dogwood) bark green with purplish yellowish green or pinkish dots (lenticels), older stems with tan, corky lenticels, pith white; winter buds with two scales that do not overlap; leaf scars U-shaped, slightly raised, connected by ridge across stem, vein scars 3 (use lens), (Harlow 1946, Petrides 1972). Leaves opposite egg-shaped to almost round, to 12 cm long, clustered on new growth, tip abruptly pointed, base rounded to wedge-shaped, dark green above, pale, white-hairy below, veins 6-8 per side, curved upward, stalks ca 3 cm, often reddish at base, winter buds narrow, pointed. Cornus rugosa flowers close-up. 2004 © Peter M. Dziuk. Minnesota Wildflowers. minnesotawildflowers.info (Accessed 1/2018). 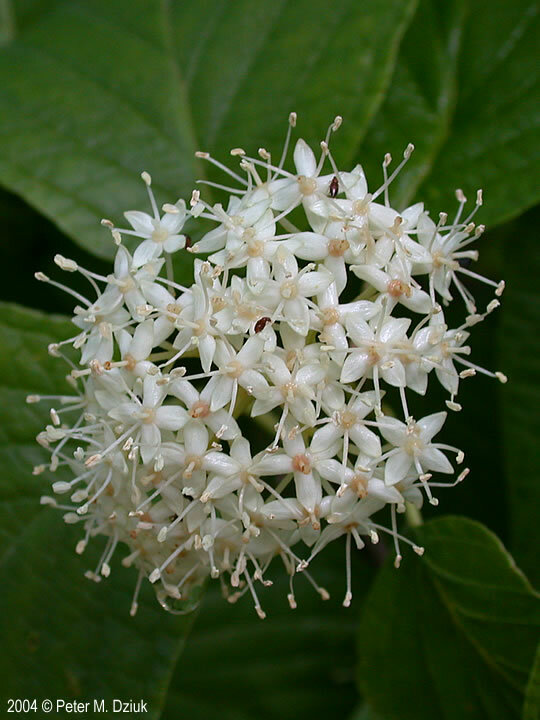 Flowers white, four-parted, small, in dense, flat or slightly dome-topped cluster, fragrant, May-June. 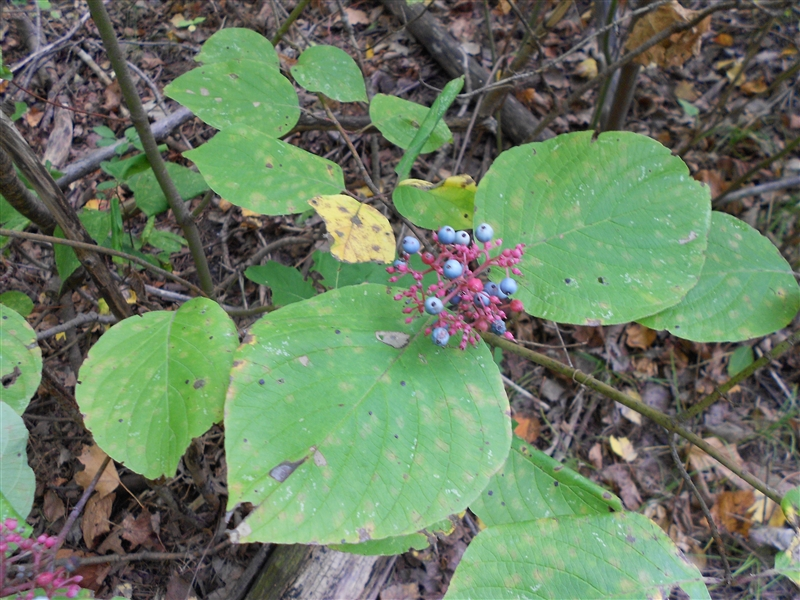 Fruit pale blue, fleshy, 1-seeded, eaten by birds, which disperse the seeds, Aug.-Sept.
Cornus rugosa fruit. L. Wallis. Herbarium University of Michigan. michiganflora.net (Accessed 1/2018). Habitat: Dry to moist sandy or rocky soil in forest understories, soil pH 6-8.5. Tolerant of shade. Intolerant of salt, drought, flooding, soil compaction (Hightshoe 1988). Possibly planted in a restorations. Moist to dry forest understories. Notes: Twigs eaten by rabbits and deer (Martin et al. 1951).